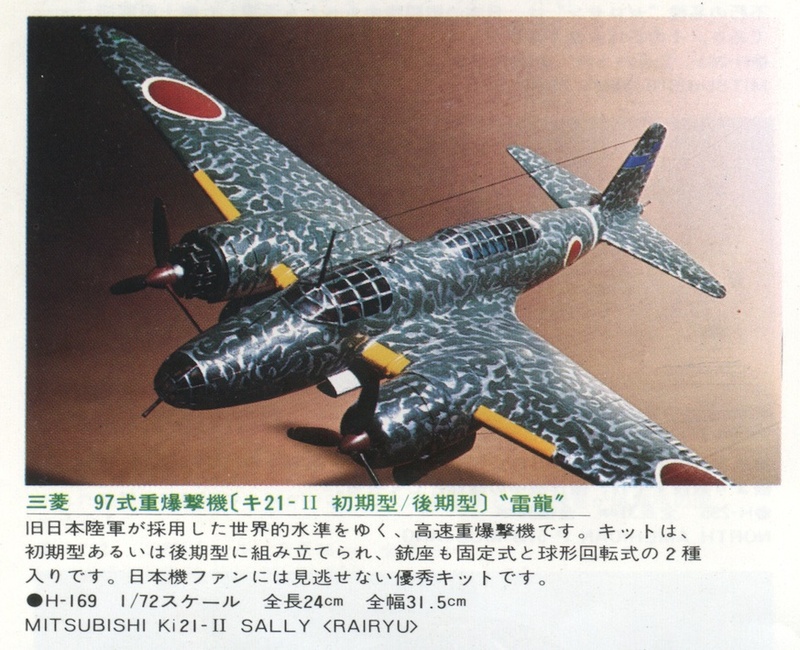 Aviation of Japan 日本の航空史: Whatever Happened to Sally (and the other Revell Twins)? Whatever Happened to Sally (and the other Revell Twins)? The remarkable Revell 1/72nd scale kit of the Mitsubishi Ki-21 "Sally", prolific JAAF bomber of the Second World War, first appeared in 1975* and was perhaps the jewel in a collection of five ground-breaking kits of Japanese twin-engined aircraft. 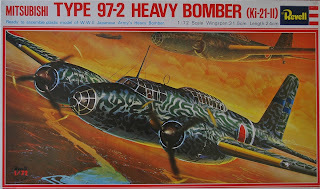 The other subjects have all since been covered by more modern kits from Japanese manufacturers; Hasegawa issuing a whole series of new kit variants of the Ki-45 Toryu "Nick", P1Y Ginga "Frances" and Ki-49 "Helen", whilst Fujimi released a series of J1N "Irving" variants. 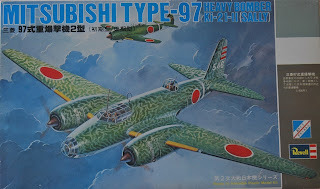 About the time that Hasegawa were embarking on this series of new, updated kits of Japanese twins, MPM in the Czech Republic released a new kit of the Ki-21, offered in two versions and subsequently in a "revised" version. Whether this had the effect of cancelling any Japanese plans for a new Ki-21 is hard to say, but the MPM kit is now almost as hard to find as the classic Revell! The world still waits for an up to date, state of the art, mainstream kit to cover what is perhaps the last significant gap in JAAF modelling. 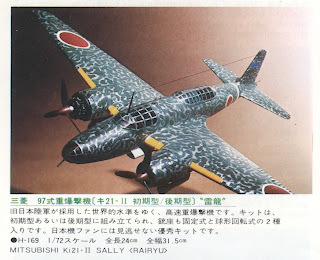 Revell's Sally appears to have originated from a licence deal in Japan with Gunze Sangyo Inc., then as now primarily a hobby paint manufacturer and Revell's Japanese licensee. It is doubtful that Gunze Sangyo actually designed or molded the kit but the actual manufacturer remains obscure. It might have been Takara because in 1980 the Ki-21 was re-released briefly under a Revell Japan brand label but with Takara's logo prominent on the side of the box - and this kit is often referred to as Revell-Takara. Whoever made it employed engineering well ahead of the game at the time with very fine recessed detail and a very attractive presentation. Received wisdom is that the mold was lost at sea with others when it was transported for manufacturing in one of Revell's other overseas plants but I have never seen the details of this confirmed. If as part of the licensing arrangement the molds belonged to Revell and the arrangements with Gunze and/or Takara came to an end I guess it is quite possible that the molds for the Japanese twins were shipped off to be returned to Revell or some other manufacturing plant. But if they are really gone forever the reticence of any of the big Japanese manufacturers to fill this very obvious gap in the 1/72nd scale JAAF line-up is curious. Do they know something we don't? Is their apparent reluctance rooted in the risk that a cheaper re-pop of the very respectable Revell kit could appear on the market in the blink of an eye? If Hasegawa were to release a Ki-21 we might expect the optional variants in Revell's original to be offered as separate kits, as well as the various markings options released one by one (or two if you are lucky) with different box art, and there probably wouldn't be much change from £60. The original Revell kit, selling for anything from £50-60 in recent years now seems to have stabilised around the £35 mark, but I guess it depends how badly you want one. On the face of it a re-pop of the Revell kit looks a viable proposition for an enterprising detective. But where is the mold? Gathering dust in a storage facility in Japan, perhaps the subject of a Jarndyce v Jarndyce type legal tussle over ownership rights, or corroding away beneath the sea? How the kit appeared in the 1976 Revell Japan catalogue - looking good! * The John W Burns guide says the original mold was issued by "Revell/Japan (Gunze Sangyo)" in the early 1980's but this seems to refer to the Revell-Takara issue. 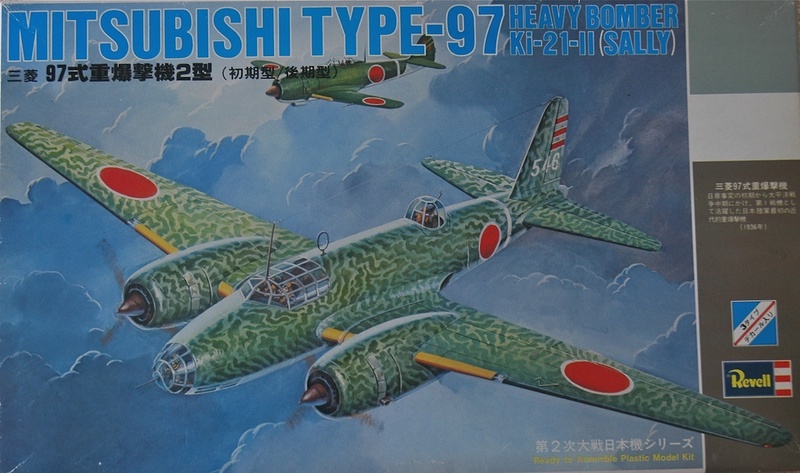 I have a Revell Japan catalogue for 1976 (with Gunze Sangyo Inc., clearly marked as the Revell Japan licensee) which has all the Japanese twins advertised in it, including the Ki-21 (see above). The first issue box, with green lettering, is copyright dated 1975; the second, with red lettering, is copyright dated 1975 and 1976 so presumably came later and the Revell-Takara box is copyright dated 1980. I'm not aware of any others? Both the Revell Japan kits are molded in dark green plastic (AFAIK) and have the Revell catalogue number 'H-169' whilst the Revell-Takara is molded in grey and has 'S39' above 'H-169'. 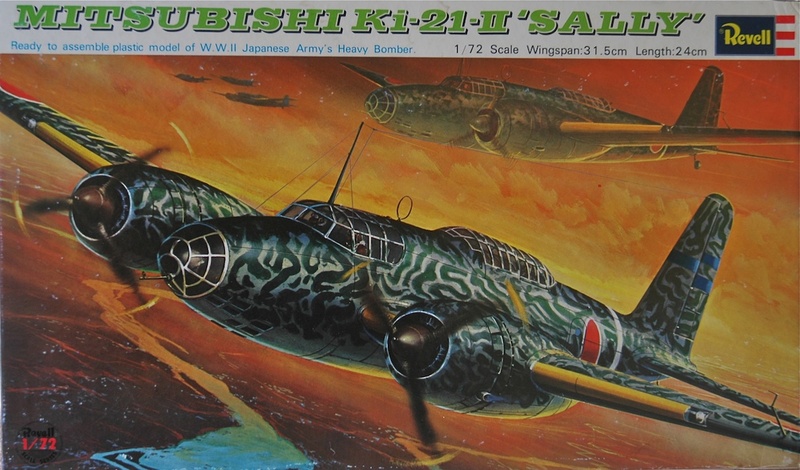 Incidentally the Revell Japan catalogue entry gives the Ki-21 the name 'Rairyu' (雷龍) which seems to mean 'Thunder Dragon' (or 'Dinosaur') - not a name I have seen used in the same way as Donryu, Hiryu, etc. If one can be had on your side of the pond for 35 quid, snap it up. I have a standing search on US eBay for this kit, and see them regularly exceed my means at up to US $80. I built one, when current, with the dorsal glasshouse. Silly me thought, at the time, that one is enough. Now, in my dotage, I want a turreted example as well. Perhaps some trivia may be of interest to some. Due to my ever expanding 'shelf of doom' it was easy to make an inspection of the five Revell kits cited. They do not appear to show a single hand made each mold. The J1N Irving has the shallowest recessed surface detail of the lot, with none at all on its gear doors. Surface detail is mostly raised on the P1Y Frances and Ki.49 Helen. That for the Ki.45 Nick and Ki.21 Sally is nicely recessed. Their recessed rivets are similar to that on the L&S Nell, perhaps just a little better done. An odd quirk is the rivets on the gear doors of the Ki.45 are raised while same on the Ki.21 Sally are recessed. Three of the five kits have raised detail on the gear doors while the fifth (Irving) has none. So perhaps more than one team of mold makers was involved. Thanks Harold. I'm not looking for one (and I'm ashamed to tell you how many I have in my stash!) but if you are I suggest you add eBay UK to your search. I have seen examples sell recently in the UK for around £30-35. Thanks for those details Ken - very interesting. I have seen the Irving molded in black, olive green and white but for some reason the white one is always covered in flash. I only have one of the Sally's in my stash and it's the first box pictured. These were amazing kits for their day and still hold up well. Hasegawa should have done this one as there are many color choices and options available. Its a graceful aircraft and I wish more showed up built. I chatted with Tony from Revellogram at the IPMS Nationals in 2001 about these molds. He indicated they were utilized by Kikoler of Brazil, Lodela of Mexico and were on their way to the US when the ship sunk. Whether they're in the Pacific or Atlantic was not determined. They are definitely sunk. Definitely would be nice if Hasegawa would do one. Thanks for the confirmation. I have never seen Kikoler or Lodela issues of the kits. Has anyone? I picked up a Revell Ki-21 in a bag with no decals or instructions back in the mid 90s for $35, and thought it was a bargain. Then last year I was looking through a stack of old kits on the 'clearance' table at a local hobby shop and stumbled on a 'green box' issue in mint condition..with a price tag of $6.99! Of course I snapped it up. My conscience got the better of me and I told the cashier that the kit normally goes for ten times that, but he didn't seem to care. I also found an MPM Ki-21 dirt cheap as a 'bagged' kit some years ago. Turns out the resin parts will fit the Revell kit quite nicely. You got a real bargain there! Lucky me I have the Ki-21 Sally as well as the Ki-49 Helen from Revell and to top it off I also have the Ki-21 sally from MPM which I have currently on the bench..